Does The Marcy Deluxe Cross Trainer Elliptical Do Enough For At Home Fitness? 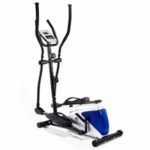 The Marcy Deluxe Cross Trainer Elliptical is a simple looking elliptical machine that is designed to provide great toning and fitness through a gentle, low impact motion. Buyers are said to be able to challenge themselves and progress with their workouts thanks to the resistance levels, data presentation and the different programmes. Users can start on the lowest setting with the basic pre-set option and then work up to tougher levels and body fat programmes. Does this machine offer enough to please buyers? 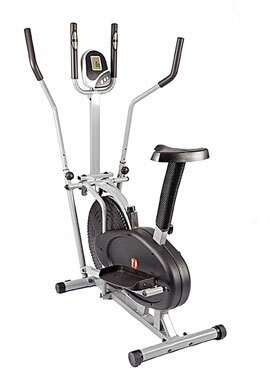 What benefits have buyers appreciated about this Marcy Deluxe Elliptical? There are some great reports about this system that suggest that it is a sturdy, reliable model that buyers can really get a decent workout from. It doesn’t have the strongest flywheel in the world, but it does have over 16 levels of resistance in a pretty solid piece of equipment, with a maximum user weight allowance of 120 kg. Many users are getting a pretty good workout with little concern about the durability and strength of the machine. It appears to be well made and there are no clear complaints about the assembly process either. The other interesting selling point with this model is the electronics. The console for displaying all the information doesn’t have much beyond the basic data on time, speed, distance, calories, pulse, scan, but the data seems to be accurate enough and is well presented. Buyers find that the back-lit screen is easy to read in bright light and easy to understand. It should also be noted that this product as pules sensors in the handlebars, which appear to work well enough. 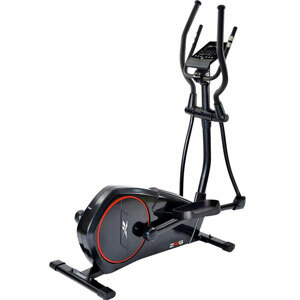 Are there any disadvantages to choosing the Marcy Deluxe Cross Trainer? Not all users are impressed with this model, however, as there are some limitations to the design and function. A lot of this seems to come down to the compact size of the machine. This elliptical trainer measures in at 107 x 60 x 158cm and is designed to suit at-home fitness regimes with its unobtrusive shape, but this does mean that the stride length can be a little shorter than some users may have expected. There are also taller users that have had problems due to their height, suggesting that this is much more comfortable for shorter users. It should also be noted that this is a mains powered model, which could limit the amount of places that users can put it. The other flaw in the design that has been noted is the fact that the foot plates are difficult to adjust. This feature should make it easier to adapt the machine to different users, but it just becomes an inconvenience. Summary: does this mean that this Marcy Cross Trainer is still recommendable? There is clearly only so much that this machine can do to appeal to everyone, and there are some definite issues with the size. Despite this, those that find the machine to be a strong, comfortable aid for daily training can still get a lot out of it. The programmes and data are stronger than expected and the issue with the foot plates does not affect everyone. 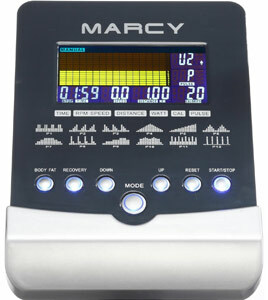 In the end, the sensors, resistance, display and construction all come together to ensure that the Marcy cross trainer is great for basic at-home use.